Many thousands of years ago there was a solitary planet in the universe unknown to Azeroth of which the Orcs were the native inhabitants. The Orcs lived simple lives, grouped into clans they held a belief in the elemental forces of nature and followed the path of the Shaman. The Orcs needed nothing more. However, fleeing from persuit, a group of aliens known as the Eredar came to the planet and set-up a colony. This group of Eredar called themselves the Draenei and they named the planet Draenor. Led by their prophet Velen, they were a splinter group from the rest of their race who would not serve Sargeras and the Burning Legion, hey had been mercilessly chased by Kil’jaeden, a powerful eredar demon lord, and finally believed that they had found a place where they would be safe. For the most part the Dranei and the Orcs kept a distance from each other, only sometimes meeting to trade in items that they needed. The Dranei, who were talented magic-wielders, kept their main city hidden and the two races co-existed peacefully on the planet. However, that peace was not to last. Agents of the Burning Legion found Draenor and picked up the tell-tale signs of Draenei magic there, but when Kil’jaeden found out about the Orcs he immediately saw that they had the potential for destruction and wanted to add this race to his army. He cleverly deceived the Orcs into believing that the Draenei were plotting against them by disguising himself as the deceased mate of one of the elder Shamans, Ner’zhul, and so the Orcs fell into his trap, not only would he add them to his Burning Legion, he would use them to take care of Velen and his followers once and for all. Kil’jaeden gave the orcs dark magic, they had never seen such power and eagerly threw away their shamanistic ways, Shamans became Orc Warlocks. Ner’zhul finally realised what was happening, but it was too late, Kil’jaeden stripped him of the power he had bestowed upon him and instead allowed Ner’zhul’s eager apprentice, who craved power, to take his place as leader.Now that Gul’dan was in place, the Pit Lord Mannoroth was instructed to give his blood to the cheftains of the orc clans to drink to show their loyalty to the Burning Legion. Most Orc cheftains drank the blood which caused their minds to be altered and a strange bloodlust decended upon them, with their new power and lust for death and destruction the Orcs destroyed any Dranei in their path and their main city of Shattrath. Many Dranei were killed and many of those who did not fall to the Orcs bloodlust were infected by the fel energy of the new Orc warlocks and became corrupted. Now hungry for more, Gul’dan with the help of Medivh of Azeroth, who was possessed by Sargeras at the time, opened the Dark Portal linking Draenor and Azeroth. Gul’dan saw a whole new world for the taking and this was exactly what Sargaras wanted. The Orcs went through the Dark Portal and destroyed anything in their path including leaving Stormwind in ruins. This was the first war and the Orcs had triumphed. But their victory was short-lived, the races of Azeroth rallied, the humans, elves and dwarves formed the Alliance of Lordaeron and thus began the second war. In the second war the Alliance pushed back the Burning Legion and attempted to close the Dark Portal, through the efforts of the Alliance it looked like the Portal had been destroyed, however a small tear between the worlds remained that could not be closed. On the other side of the Dark Portal, now cut off from Azeroth, the clans fought against each other, unable to quell the bloodlust and with no enemies to fight – something had to be done. Ner’zhul, who had been injured during the destruction of the Dark Portal, was visited by the Orc deathknight Teron Gorefiend. Gorefiend had a plan to open more portals on Draenor to other worlds, but he needed two things: Ner’zhul to lead the horde once more and some rare artifacts – from Azeroth. Ner’zhul agreed to the plan and recovered the artifacts, but he was followed back to Draenor by the Alliance who sought to retrieve them, unfortunately the party from the Alliance were too late and Ner’zhul had already started to open portals to other worlds and by doing this Ner’zhul was destroying Draenor, the planet was literally ripping itself apart under the strain. The Alliance could only do one thing, they needed to break the link between Draenor and Azeroth before it was too late and both planets were destroyed. Ner’zhul quickly abandoned the horde and escaped through one of the portals just before the planet was ripped apart sending pieces of the shattered planet to float in the Twisting Nether, the Alliance party sent through the Dark Portal were presumed dead. 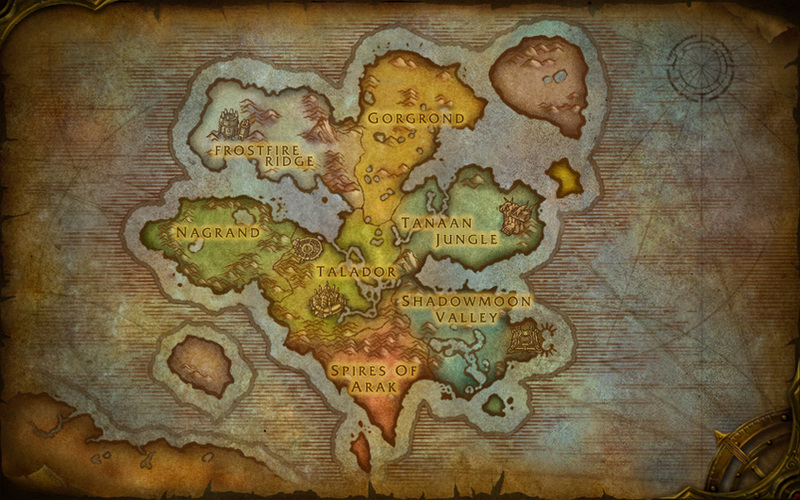 The bits of Draenor that remained became Outland and though many perished in the destruction, those that survived lived on. Years later, the Dark Portal between Azeroth and Outland was re-opened, but there was little for anyone in Outland anymore and the draenei were happy to remain on Azeroth with their newfound Alliance allies.